Enbridge Income Fund’s (the Fund) renewable and alternative energy assets – wind, solar and waste heat recovery facilities – collectively generate more than 1400 megawatts (MW) of environmentally-friendly power. The Sarnia Solar Facility is among the world’s largest operational photovoltaic solar power facilities. Located on 950 acres on the southern shore of Lake Huron in Sarnia, Ontario, it is comprised of eight 10 MW segments with a total capacity of 80 MW. Power from the facility is sold under 20-year fixed-price Power Purchase Agreements (PPA) with the Ontario Power Authority (RESOP) in effect until 2030. Both the 15 MW Amherstburg Solar Facility and 5 MW Tilbury Solar Facility are ground-mount, thin-film photovoltaic facilities located just south of Sarnia, Ontario. Power from the facilities is sold under 20-year fixed-price PPAs with the IESO in effect until 2030 and 2031 for the Tilbury and Amherstburg facilities, respectively. the Cruickshank Wind Farm which generates 8.25 MW. 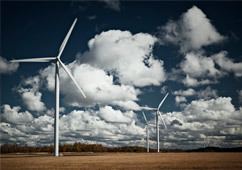 The Ontario Wind Facility uses 115 Vestas V82 turbines, with an aggregate capacity of 190 MW. Power from the Ontario Wind Facility is sold to the IESO under PPAs that are in effect until 2028 and 2029 for the Cruikshank and Kincardine wind farms, respectively. The Talbot Wind Facility is situated on the northern shore of Lake Erie, near Chatham, Ontario. It has a capacity of 99 MW generated by 43 Siemens Energy SWT 2.3-101 wind turbines, each with a rated capacity of 2.3 MW. Power from the Talbot Wind Facility is sold under a PPA with the IESO until 2031. The Greenwich Wind Facility is situated on the north shore of Lake Superior near Thunder Bay, Ontario. It utilizes 43 Siemens Energy SWT 2.3-101 wind turbines with an aggregate capacity of 99 MW. Power from the Greenwich Wind Facility is sold to the IESO under a PPA until 2031. The Massif-du-Sud Wind Facility is situated 100 km south of Quebec City, Quebec. It has a capacity of 150 MW generated by 75 Senvion MM82/92 wind turbines, each with a rated capacity of 2 MW. Power from the Massif-du-Sud Wind Facility is sold to Hydro-Quebec under a PPA that expires in 2033. The Lac-Alfred Wind Facility is situated 400 km northeast of Quebec City in Quebec’s Bas-Saint-Laurent region. It has a capacity of 300 MW generated by 150 Senvion MM82/92 wind turbines, each with a rated capacity of 2 MW. Power from the Lac-Alfred Wind Facility is sold to Hydro-Quebec under a PPA that expires in 2033. The Blackspring Ridge Wind Facility is situated 50 km north of Lethbridge, Alberta. It has a capacity of 300 MW generated by 166 Vestas V100 wind turbines, each with a rated capacity of 1.8 MW. Power from the Blackspring Ridge Wind Facility is sold to Alberta Power Pool. Leases with private landowners for an initial term of five years, with automatic renewal for up to an additional 40 years and subsequent renewable rights thereafter. The Saint-Robert-Bellarmin Wind Facility is situated 300 km east of Montreal, Quebec. It has a capacity of 80 MW generated by 40 Senvion MM92 wind turbines, each with a rated capacity of 2 MW. Power from the Saint-Robert-Bellarmin Wind Facility is sold to Hydro-Quebec under a PPA that expires in 2032. SunBridge Wind Farm is located five kilometres southeast of Gull Lake in southwestern Saskatchewan. It uses 17 turbines with a total capacity of 11 MW. Power produced at SunBridge is delivered into the Saskatchewan power grid and sold to Saskatchewan Power Corporation (SaskPower) under a long-term PPA that expires in 2022. The Magrath Wind Facility is located seven kilometres southwest of Magrath in southern Alberta. It utilizes 20 turbines with a total capacity of 30 MW. The electricity produced at Magrath is delivered to the Alberta power grid through long-term fixed-price agreements. The facility is operated by Acciona Wind Energy Canada Inc. The Chin Chute Wind Facility is located 20 kilometres southwest of Taber, Alberta. It utilizes 20 turbines with a total capacity of 30 MW. The power generated at Chin Chute is delivered to the Alberta power grid through long-term fixed-price agreements. The facility is operated by Acciona Wind Energy Canada Inc. 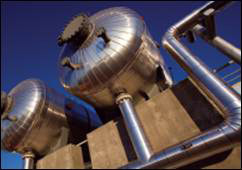 The Fund has a 50% interest in NRGreen Power, which operates five non-regulated waste heat recovery facilities with an aggregate capacity of 33 MW (17 MW net to the Fund), which are located at compressor stations along the Alliance Pipeline. Four of the facilities are located in Saskatchewan and one is in Alberta.